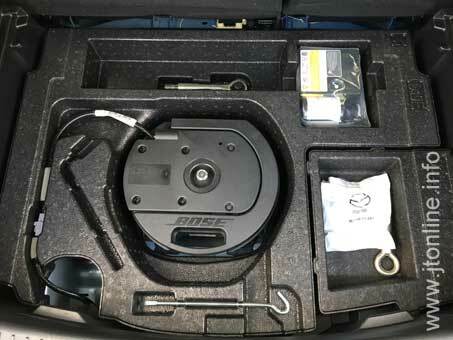 Installing an 18 inch spare wheel in a Mazda CX-3, along with the Bose subwoofer. In the U.K., Mazda provide a tyre repair kit which is comprised of a bottle of liquid sealant, a valve tool and a 12v compressor. There is an official spare wheel kit available at extra cost, which is a 16″ steel space-saver wheel & tyre, with pertinent accessories. I’m not a fan of the emergency repair kit. It’s only designed to repair tyres that have a small foreign object stuck in the tread portion of the tyre. 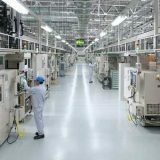 To use it, you have to deflate the tyre, extract the valve core, pour in the sealant, reinsert the valve core and re-inflate the tyre and hope for the best. You can’t get the hole repaired later by a tyre specialist, you have to replace the tyre. The space-saver wheel & tyre isn’t ideal either. You’re advised not to use it on the front axle, you have to stick to a maximum of 50mph, and only use it for a very short distance. Remove the luggage board and mat from the boot. 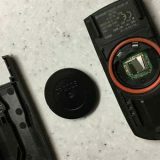 Using the wheel nut wrench or other 21mm socket, remove the central bolt holding the Bose subwoofer in place. Uncouple the connector on the subwoofer cable by squeezing the tab firmly and pulling apart. Remove the subwoofer from the boot. Remove the expanded polystyrene pieces from the boot (these will be replaced with new ones). Remove the cover from the right-hand side of the boot space and install the scissor jack with the jack bolt as per instructions in the vehicle owner’s manual. Replace the cover. Lay the insulator mat in the boot. Because the full-size wheel is deeper than a space-saver wheel, the original mounting bolt is too short. 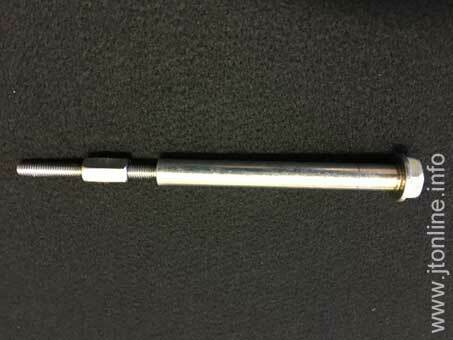 I increased it’s overall length to 200mm by adding an M8 threaded nut and a short length of M8 threaded rod, held in place by a drop of thread lock. 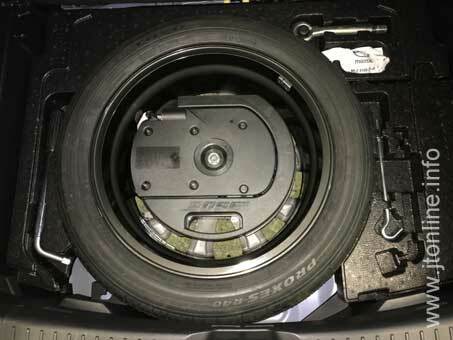 Place the new spare wheel into the boot with the outside face of the wheel against the insulator mat. Feed the subwoofer cable under the tyre and up through a gap between the wheel spokes. Put the subwoofer into the spare wheel and recouple the cable connector. Align the subwoofer so that it’s handle is facing the rear of the car. 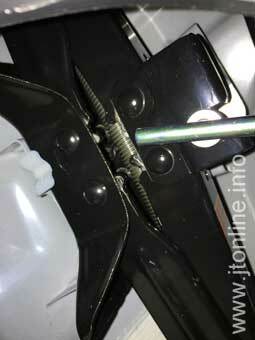 Then put the central clamp bolt in place and tighten. Place the new expanded polystyrene pieces around the spare wheel. Put the towing eyes, jack lever, wheel wrench & locking wheel nut key into the cut-outs in the pieces around the spare wheel. Replace the luggage mat and luggage board. Because a full size wheel is deeper than a space-saver wheel, you lose the ability to drop the luggage board to its lower position. I’m getting my cx3 tomorrow and would like to fit this spare to my cx3 sport nav can you tell me roughly how much the bits and pieces cost to buy? At the time of writing the article, the list price at the parts department of my Mazda dealer was £242.38 + VAT, but I negotiated a discount. The pieces for the mounting bolt were a few pounds from Screwfix. The tyre, valve and balancing was another £83.60 + VAT from a local independent tyre shop. I don’t know how this compares with the price for the Mazda 16″ space saver kit, but you can ask your dealer for a quote. For your information I will compare all the options. Very pleased with my first day with the car drives very well, impressed with the amazing lights.. Thanks for this guidance Julian I have just completed it having persuaded Mazda to include a full size spare with all the jack etc in my negotiated price for the car. Couldn’t have been simpler to complete for about £3 ! Hi Peter, thanks for your comment. I’m pleased to read that my article was useful. Enjoy driving your CX-3. Thank you for taking the time to provide so much useful information. 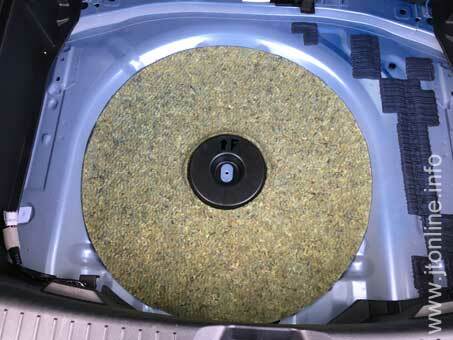 Do you happen to know why Mazda provide a new “trunk mat”* with their space-saver wheel kit? I assume you are just using the one you already had – or am I confused? I didn’t buy the space-saver wheel kit, so I can’t be sure whether or not it includes a new trunk mat. It’s just a piece of black carpet material, with possibly some foam spacers stuck on the underside. I’m not using the space under the removable luggage board and so I’ve omitted the trunk mat on my vehicle. Thanks for viewing the site and leaving your comments, Chris. Have done mine, full sized steel spare securely fixed in place. I notice you say ‘full size steel spare’ which is different to Julian’s alloy wheel fit. What size wheel and tyre did you use please? Julian, Thanks for that. Acquired a wheel, tyre and jack and made the rest. Personally I’m not too keen on the idea of trapping sub woofer cable under the tyre and you don’t mention the heavy plastic moulding which fits under the woofer. Thanks for your comments, Allan. Is the subwoofer cable long enough to go over the top of the wheel? I didn’t check. The reason I didn’t mention “the heavy plastic moulding” is simply because there wasn’t one in my vehicle, just the black plastic piece around the mounting hole that you can see in my picture of the insulating mat. Hi Nigel, I don’t think the subwoofer cable will go over the top of the wheel. I’ll have a look at the weekend, but I’ve not had any issues with the way I routed mine and it’s been that way since November 2016. LD47-69-671 is the wheel nut box spanner (wrench) and, by means of a hole in the handle, also acts as a winding handle for the Mazda scissor jack. I’ve had another look, and the wheel/tyre does not rest on the subwoofer cable, if that’s your concern. I haven’t tried re-routing my cable over the top of the tyre, it would probably reach OK, but I don’t think it’s a better route. Re these parts are they the ones for the 16 inch space saver wheel which is the one i intend to fit. Yes, the parts are the same as the ones you would get if you ordered the spare wheel kit from a dealer, only then you would get a 16″ space saver steel wheel. are all these parts available from the dealer ? Hi Julian, I’ve got mine CX3 just few days ago…. I want to fit full size wheel as well. As Steve asked where did you get your set up, from the mazda dealer or somewhere else. Can you give a link of the shop if so. Thank you. I hope you’re enjoying your new purchase. 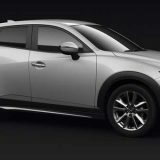 I got the Mazda parts detailed in this post from the parts department of my local authorised Mazda dealer. I’ve edited the post to make that clear. You may also find people selling some of the parts second-hand on online auction sites or via car forums. The M8 threaded rod and coupler I got from Screwfix, and the tyre was supplied and fitted by a local tyre shop. Hi Julian, Ive just bought a second hand relatively new space saver 16in and jack from a current model Mazda 3. Am I right in assuming the existing subwoofer bolt will still fit with both the spacesaver and subwoofer in place or will a longer one be needed? Also would there be any adverse consequences if the new polystyrene inserts weren’t fitted? Or Could I perhaps trim the existing ones to fit for example? The recommended space saver tyre size is T125/90D16 98M, if that’s what you’ve bought then I should think the existing retaining bolt will hold the sub and wheel in the boot without further modification. I don’t think you need the surrounding inserts, if you’d prefer not to buy them. You’d need to find something to wrap the wrench and towing eye hooks in to stop them rattling about in the boot. 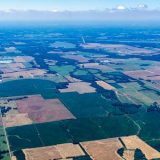 The name and comment that you submit will become publically available and may be indexed by internet search engines and may appear on websites not connected with this one. Your name and email address are required, but your email address will not be shown. If you have created an avatar at Gravatar.com it will be shown next to your comment on this website. Save my name, email address, and website address in this browser for the next time I comment. 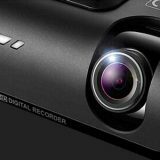 Notify me by email of new comments on this article. jtonline.info © 2019. All Rights Reserved. You may not copy, reproduce, republish, download, post, broadcast, transmit, make available to the public, or otherwise use content from this Web site in any way except for your own personal, non-commercial use. You also agree not to adapt, alter or create a derivative work from any content found on jtonline except for your own personal non-commercial use. Any other use of content from jtonline requires the prior written permission of the domain name holder.